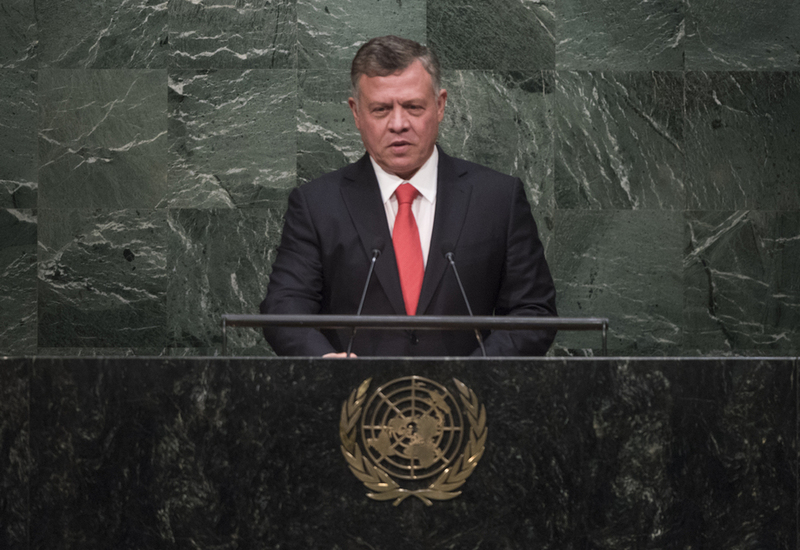 ABDULLAN II IBN AL HUSSEIN, King of Jordan, said a more peaceful future was under threat by khawarej, the “outlaws of Islam”, operating globally, targeting religious differences and hoping to kill cooperation and compassion among people of all faiths through suspicion and ignorance. He asked what the world would look like if those forces were not defeated, if a future where mass murder, public beheadings, kidnapping and slavery were common practice. Such a crisis would constitute a third world war, which would require a response of equal intensity, with collective action on all fronts. “But make no mistake: The more important war is the one we wage on the battlegrounds of the heart, soul and mind,” he said. Outlining ways leaders must build the road ahead, he stressed first the need to return to the shared spirit of the world’s faiths and creeds: love, peace, justice and compassion. “Let’s change our tone,” he said, asking when and how fear and intimidation had crept so insidiously into our conversations. Indeed, the world was threatened when fear and anger dominated discourse, whether in schools, sermons or international affairs. The third step was to act upon our beliefs, by loving one’s neighbours and being kind to one’s children. The voice of moderation must be amplified, by populating the media and minds of young people with the purity and power of that principle. It was also important to recognize deceit, he said, asking whether there was a crime worse than twisting God’s word to promote one’s own interests. He urged protecting the purity of the Muslim faith from worldly contamination. “As Muslims, this is our fight and our duty,” he stressed. Moderation did not mean accepting those who trampled on others. Today’s global fight was not between peoples, communities or religions; it was between moderates of all faiths against all extremists in all religions. Leaders must take a clear public stand against intolerance by respecting all places where God was worshiped. In framing that issue, nothing had more impact than Jerusalem and he rejected threats to holy places and the Arab character of that city. Finally, he advocated a hyper-connectivity that brought people together in consciousness and common cause, underscoring the world’s obligation to provide relief for the millions of refugees in his region. Vital United Nations programmes and agencies, such as the United Nations Relief and Works Agency for Palestine Refugees in the Near East, the Office of the United Nations High Commissioner for Refugees and the World Food Programme faced huge shortfalls. Syrian refugees constituted 20 per cent of his country’s population and it was high time that the international community supported countries such as Jordan and Lebanon, which had carried the brunt of that burden for the past four years.